Despite their tusks, walruses seem cute. Indeed, most marine biologists think they use their massive chompers just to eat clams and other shellfish. But walruses have a secret: they sometimes indulge in meatier meals. 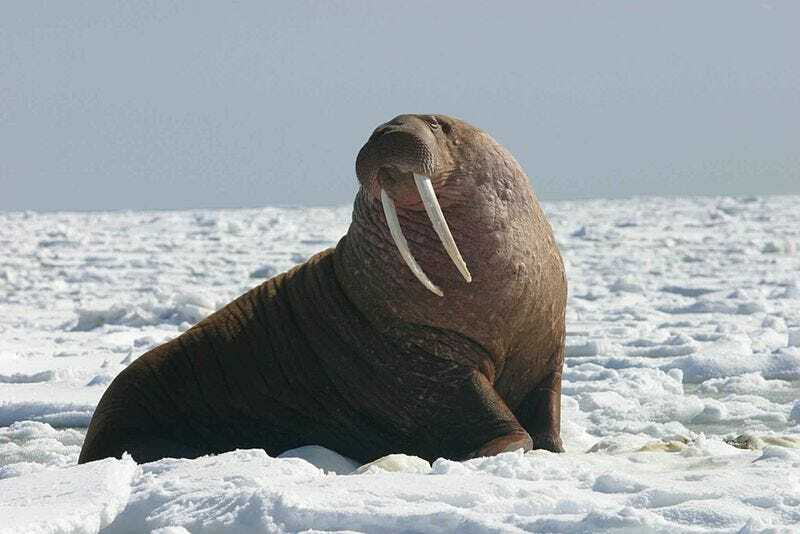 The first clue that walruses used their tusks for more than breaking through clamshells came in 2008, when the BBC revealed footage of walruses chasing after eider ducks. "What? Walruses hunting ducks? Didn't they eat clams and other shellfish? What nonsense!" thought marine biologist Adrian Burton. "Yet here was visual evidence that these white-tusked, bristle-lipped pinnipeds might be something more than the bottom-feeding mollusk-munchers I had thought them to be." When a paper was published describing the scene caught by the BBC, the authors were careful to note that they never witnessed a walrus actually catching a duck, only chasing them. Perhaps they were playing, rather than hunting? I read several accounts reporting fowl to occasionally feature on walrus menus. One, published in 2004, recorded thick-billed murres (Uria lomvia) being taken time and again by walruses off Coats Island in Hudson Bay, Canada. All they left behind were the bones and feathers, the walruses' pumping tongues creating enough of a vacuum to strip the birds of their softer body parts. Another report recounted numerous successful attacks on pink-footed geese (Anser brachyrhynchus) off the Norwegian island of Svalbard, the flightless, molting birds as easy a target as turkeys at a fairground shoot. Even bits of a swift black guillemot (Cepphus grylle) had found their way into the gut of a walrus off Alaska's St Lawrence Island. A male Walrus which was shot measured 11 ft from the tip of the nose to the extremity of the spine, and 9 ft in girth. The stomach of this Walrus was filled with large pieces of Seal's skin, with the blubber attached, and also of pieces of liver. Last season we shot two, and both their stomachs were similarly filled; one of them, which was shot in the water, had a floe Seal in its mouth which it had just captured; so that the unfortunate floe Seals, persecuted on the ice by the Bears, are preyed upon by the Walrus while in the water. Stories have also been told of walruses gobbling up polar bears and even narwhals. Those tusks aren't just meant for scraping shellfish off of rocks. They're a pair of lethal weapons, a menace to bird and mammal alike. You've been warned.